Counting Down…2 more sleeps until Local Author Jacqueline Halsey’s event at our store!!! 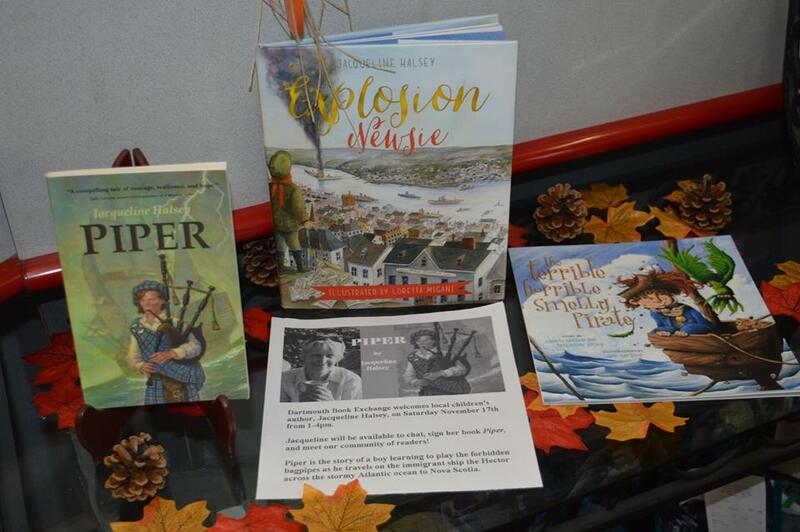 Dartmouth Book Exchange is pleased to welcome Local Children’s Author, Jacqueline Halsey, Saturday November 17th from 1-4pm. She will be bringing her latest book “Piper”, a middle grade chapter book for ages 8-12, as well as copies of her book “Explosion Newsie”. The store will also have copies of her picture book “The Terrible, Horrible, Smelly Pirate”. We are so excited to host this event at Dartmouth Book Exchange, providing an opportunity for our community to come and meet this amazing Local Author. Piper: It’s 1773 and twelve-year-old Dougal Cameron and his whole family are set to sail away from their Scotland home forever. When tragedy strikes, the family must decide whether or not to make the trip without Dougal’s father. Once the ship departs, Dougal is drawn to the haunting sounds of the lone piper on board. (The instrument, while still illegal in their homeland at the time, was brought aboard to keep spirits up.) When a violent storm knocks the Hector two weeks off course, Dougal’s dream of becoming a piper has to take a back seat to keeping his three little sisters alive. Explosion Newsie: On December 6, 1917, two ships collided in the busy wartime harbour of Halifax, Nova Scotia. The resulting explosion was the biggest man-made blast prior to the development of nuclear weapons. It flattened one fifth of the city. Thousands of people were killed that day and thousands more injured or made homeless. One lucky survivor, ten-year-old newsie Macky, has a key job to do — get the news out.